FIFA will officially categorize August 10th's match between the US and Mexico as a "Friendly" on the international fixture date. But to US Soccer supporters and the players who will get the call-up, it will be nothing of the sort. Any match that that sees "The Nats" go toe to toe with "El Tri" is never a simple Friendly. Couple that with the debut of USSF's "Golden Boy" Jurgen Klinsman and you have yourself an "Uber Exhibition". Prior to last week's out-of-the-blue announcement that the USSF had sacked Bob Bradley as USMNT's Manager the August 10th fixture versus Mexico already had all of the ingredients necessary for a savory battle. The announcement of Jurgen Klinsman taking the reigns only made it that more intriguing. 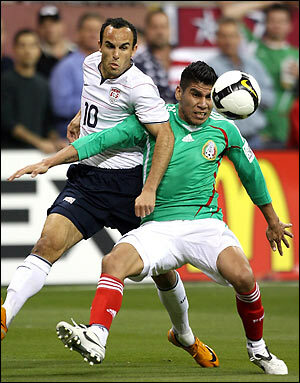 Mexico had just finished handing the United States a humbling defeat in the 2011 Gold Cup Final just over a month ago. Along with taking the Gold Cup out of the US's grasp they had also earned themselves a spot in the coveted 2013 Confederations Cup with the victory. 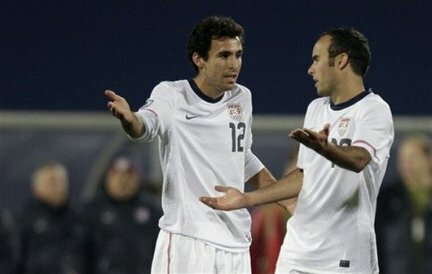 The USSF had credited the US's involvement in the 2009 Confederation's Cup with the United States' group stage success in the 2010 World Cup. They were hoping to repeat that experience in Brazil for 2013. But instead it will be Mexico that will relish in that chance come 2013. Something that i am sure leaves a sour taste in every USMNT player's mouth. Tim Howard's last outing against Mexico was...frustrating. As if that wasn't enough, Mexico's dominating performance during the Gold Cup left many soccer pundits believing that Mexico had regained it's place on top of CONCACAF as the regional powerhouse- something the US had enjoyed for the past few years. One such believer in Mexico's recent resurgence was none other than US Soccer's new manager, Jurgen Klinsman. He pushed aside any negativity surrounding the US' performance in the final of the Gold Cup, saying that Mexico had played itself into a top 10 ranking worldwide. So facing Mexico as his first opponent as USMNT Manager will hold that more significance as he as well as every other US Soccer fan will want to prove that US Soccer will not want to play second best in CONCACAF. And try and regain some of the pride that Mexico snuffed out of us during that sad day in June. The US player's themselves are also anticipating the August 10th match with a sense of importance that hasn't been seen since the World Cup. The "Old Guard" of players that were shoe-ins under Bob Bradley have to realize that with a change at the top comes a need to prove yourself once again on the national stage. This should bring an even greater elevation of play on the field which will hopefully get the US rejuvinated and show supporters that the recent trend of slow starts and sluggish performances are a thing of the past. The much anticiapted roster announcement was initally scheduled for release today but was postponed until tomorrow late this afternoon. The names that Klinsman will include are something that many are eagerly anticiapting. Klinsman may not be able to have his first choice of selection for this months fixture, since many of the European based players are gearing up for the start of their seasons and may not be available. This makes his selections even more interesting because they may offer a glimpse into the players he may have on his long term radar. Essentially giving fans a chance to see who may continue with the US squad and what new blood Klinsman may want to inject in the line-up. His connections with Germany throws yet another curve ball of curiosity into the selections tomorrow. Surely a few of the regulars are probably in no danger of having their phones silenced during National Team call-ups. Staples such as Donovan, Dempsey, and Howard will most likely continue to be fixtures in our starting XI. However, some of the aging vets such as Cherundolo, Bocanegra , and Oneywu may not be in Klinsman's long term plans so they may have to view August 10th as nothing short of a trial to show their worth. Other players who seemed to always raise eyebrows by fans for their continual selection such as Bornstein and Clark may have seen their last minutes in a Nats uniform. But these are by no means the only members of the USMNT who need to impress on the 10th. Everyone will have to bring their "A" game if they plan on cementing their future with the side, including the coaching staff. Klinsman announced that he will be bringing in "Guest" assistants for the upcoming friendlies to essentially audition the supporting cast that will one day make up his staff. Although the names of both players and guest coaches has yet to be announced there is no doubt that come kick-off on August 10th the United States will be witnessing the most important and anticipated Exhibition match in US Mens National Team recent history. There will be as much focus on the field as off the field as millions of people worldwide will tune in to see the first incarnation of the Jurgen Klinsman era for US Soccer. With that I say, "Willkommen and good luck, Boss". Pedro Gomes is a frequent contributor to MLSReserves. 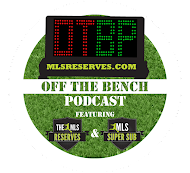 He can be reached at uvagnomes@gmail.com or followed on twitter @MLSSuperSub.